Farming makes a great part-time job, especially if the whole family can help out. If you want to make a little extra money, or you are a work-at-homer, or if the kids want a summer job, being a part time farmer can be very rewarding. I know one farm kid that paid for her college tuition with a CSA garden on her parents' grain farm. It's quite possible for the part time farmer to make an extra $10K or so over a summer, while also receiving the benefits of owning a business. No commute, no pollute, and cash in your pocket; the part-time farmer has a great gig. Here's some tips to get started. First, count your assets. What can you bring to the business? This includes your time, equipment, land, and skills. For example, if you are planning a small market garden, maintaining it will take regular attention during the week. I would suggest that at a minimum, the garden will need work on weekends and again mid-week, to keep control of weeds and to harvest veggies before they become over-mature. That's why we have two pick-and-deliver days each week - Monday and Friday - and also have an on-farm pickup day Wednesday, to keep the veggies at the peak of picking perfection. Don't spend a fortune to get started.the part time farmer doesn't need a lot of equipment at the beginning. Buy used, and its better in many cases to rent or borrow or hire out the work rather than buy big iron. Our first year, we made some grow-light stands out of 2 x 2 and cheap florescent shop lights. We plugged the lights into a power bar, and put the power bar on a timer, giving the plants 15 or 16 hours of light daily. Total cost for the stand was about $120, including the lights. it started life as a home-made pickup trucker cap. We bought used feed troughs and buckets, and a couple big steel bins on wheels to keep our feed grain in. We did buy a new fence charger and electric mesh fencing. Raising pigs and raising chickens takes less work than the garden, and might be more practical for the part time farmer. We spend about 30 minutes a day to look after our small livestock. The first year we raised meat birds we tried chicken tractors, but they never worked well for us. 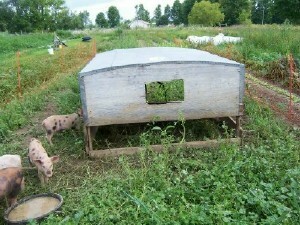 The next year we invented our Movable Coop; it costs about $150 to build new. We now have two of them to raise several hundred birds a year. We raised the day-old chicks in homemade broody boxes with heat lamps to keep them warm. Our first batch of birds paid for all the equipment, and we ended up with a freezer full of chicken dinner to boot. I figure I made about $20/hour for the time I put into those birds. How will I sell my goodies? Even the part time farmer has to consider cash flow. Do you have an off-farm job that brings you in contact with a lot of people? This is a great market for the part-time farmer. 'City folk' just can't get enough of really good fresh farm veggies, eggs, and pasture-raised meats. Just tell your co-workers (or neighbours, or Scout troop, or hockey buddies, etc) that you will be raising your own food, with limited quantities for sale, and if they hurry they can get on the list to get some! You can also take deposits from your customers, to help cover start-up costs. A market stand can work, if you have sufficient traffic or can attract it with some local advertising. You need to consider sight lines for your signage, parking and also liability insurance for anyone entering your property. The advantage of a stand on your property is you don't have to leave the farm. This is one of the drawbacks with farmer's markets; every hour at a market is an hour you can't work the farm. I'm partial to the CSA model, but however you choose to market your farm goodies, you need to do some farm planning and break-even analysis to determine if you can make a profit. If you can't make it work on paper, you can't make it work, period. Try to start smart, but get started Whatever and however you decide to do, get started now. Even if you are not ready to be a part time farmer just yet, there is a step you can take right now to advance your goals. You can intern or apprentice on a farm, join WWOOF http://www.wwoof.ca/ and get some experience on a farm, or get other farm-related work that will bring you closer to your goal. http://www.goodworkcanada.ca/ is a great resource for someone looking for a 'green' job. And when you are ready. you don't need a farm to get started farming. I know a young couple who lived in an apartment in a town outside Ottawa, and made friends with an older farming couple. 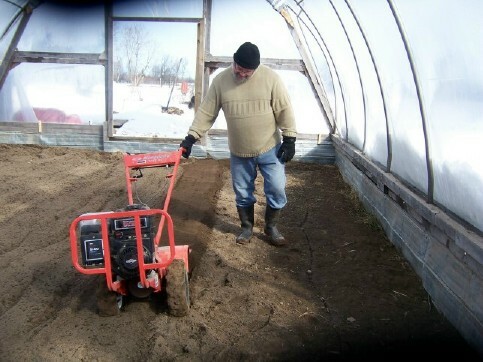 This couple rented them a some land on their farm, helped them put up a small greenhouse, and provided use of a tractor and tillage equipment. Eventually that couple had a two acre market garden, with 77 CSA customers and sales to local restaurants and a natural food store. They worked very hard and very long hours for several years, but last year they bought a farm of their own. I'm sure they will make a go of it because they put in the hours to learn the business. Take inspired action, and dreams come true. Now is the time to start planning your farm for next season, check out the links below and the resources at right to help you make your career as a part time farmer a success . . .